The tackle class is one of the deepest in recent memory. At PFF, we’ve been traditionally lower on many tackles because of the steep learning curve the position faces when translating to the NFL, but there are four players in this class we think have a chance to start immediately. Let’s take a look at how the top-10 shape up. 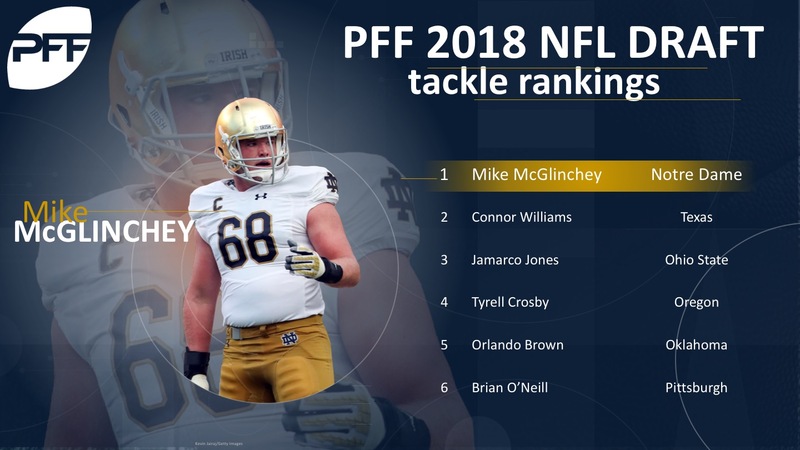 McGlinchey’s three-year sample of grading is about as good as we’ve seen since we started grading college players and easily tops in this class. The fact that he’s done it at both left and right tackle makes it that much easier a projection to the next level. He’s far from a perfect prospect, but he does so many things well that he’s ascended to the top of this class. Scrap Williams’ injury-riddled 2017 tape and go back to his sophomore year. That season he was utterly dominant and allowed only four pressures all season. Not many true sophomores are capable of the level of play we saw from Williams in 2016, as he flashed all the tools necessary to be a high-level tackle in the NFL. Jones wins the award for prettiest pass sets in the entire class. That’s even more encouraging considering how little Ohio State’s offense asked him to take true pass sets. He’s already NFL ready in that regard and has improved every season of his college career. Crosby is arguably the most physical tackle in the entire class. He’s also another player who has done it on both the left and right side in the college ranks. Crosby’s not going to win any awards for his athleticism, and could ultimately end up at guard, but he’s an easy projection as a run-blocker. Brown has more reps on tape that make you say ‘wow’ than any offensive tackle in this class. He quite simply engulfs defensive linemen on a regular basis. He may struggle with speed at times, but he’s impervious to the bull-rush with his size and length (didn’t allow a single bull-rush pressure all year). O’Neill is a terrific athlete for the position and possesses some of the best mirroring ability in the entire class. His punch and play strength are lacking at the moment though, and it’s concerning how poorly he performed Senior Bowl week. While there, he won only 27 percent of his reps in 1-on-1 practice. Miller has the size and athleticism to stay at tackle at the next level, but he’ll need to add a good deal of strength to be a quality player at the next level. He was bull-rushed far too frequently against college defenders and that issue will only increase exponentially in the NFL. Richardson took a huge step forward in 2017 and allowed only five pressures all season long and never more than one in a single game at right tackle for the Wolfpack. Richardson has a handful of off-field issues that could drop him down boards, though, including a DUI as a freshman and a two-game suspension for marijuana this past season. Louisville did Christian no favors by having him flip from left tackle to right tackle in each game depending on the play call. That cross-training though could come in handy in the NFL. Rankin is one of the few extremely long-armed tackles who already knows how to utilize that length advantage properly. His slow feet could cause a rocky transition to the NFL however and he allowed 18 pressures on only 247 pass-blocking snaps this past season. Okorafor is nothing more than a projection at this point. His size, length and athleticism scream NFL tackle, but his technique and physicality leave a lot to be desired. One would expect a tackle of his caliber to dominant against the competition Okorafor faced, but that was all too infrequently the case. Harrison’s movement skills jump off the tape immediately when you watch him. He’s a tad undersized though and will see a huge leap in competion coming from West Georgia. Another small school tackle who pops off the tape. Cappa however, does so because of his impressive technique rather than pure athleticism. Adams has impressed as a pass-protector in his time at NC State. The past two seasons he’s allowed all of 17 pressures. Crabtree is one of the rare college tackle who is already technically proficient in pass protection, allowing all of 12 pressures this past season. Irwin was very productive in his four seasons at Colorado, improving in grading every single year. He’s far too easily knocked off balance though and is undersized for a tackle. Noteboom fits what the NFL is looking for from a size and athletcism standpoint, but was far too often exposed in pass protection in college. Weathersby is an ox whose best position is likely guard at the next level. In a phone booth, he can look dominant, but when he has to play on the move it’s far less pretty. With three straight years of grades in the 84.0 to 86.0 range, Golditch is worth a look in the late rounds. He ranked 10th in the draft class with a pass-blocking efficiency of 98.2 last season.